Still in holiday atmosphere, you could come to Thailand to enjoy some of which became the mainstay tourist attractions in Thailand. For example, Rayavadee which offers beautiful beaches and accommodation for the artists. To arrive at Rayavadee, you need time to go to the peninsula in 500 kilometers to the southern city of Bangkok. This is an unforgettable experience in the life of all people. 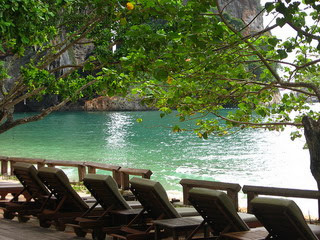 Interestingly, Rayavadee Resort is easily accessible by a speedboat boat that departed from a pier in Krabi Town. While enjoying the journey, you see the beauty of Phra Nang beach out there. 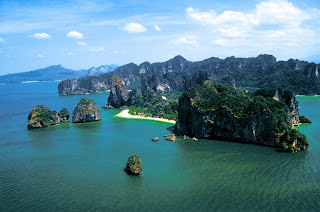 Rayavadee occupies a land area of ​​26 acres filled with beautiful gardens and is suitable for honeymooners for artists, such as Gwyneth Paltrow, Kate Moss and Colin Farrell as well as ordinary tourists. Rayavadee or 'Land of Princess' is one of the biggest attractions at the corner of the beach, Phra Nang is located on the edge of Krabi Marine National Park. There are also nearby Tham Phra Nang cave believed to locals as a place to live Goddess Princess. If you are curious about the beauty of Rayavadee, Direct visit this place. Happy holiday to Thailand.